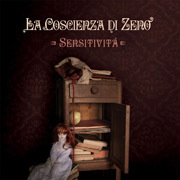 The band La Coscienza di Zeno, founded in Genoa in 2007, takes its name from the story of the same name by the Italian writer Italo Svevo (German: "Zenos Gewissen"). Three years after her self-titled debut, she is now launching her successor. The sextet with two keyboardmen makes use of the genre from the seventies with the heroes, but above all with their dense, partly gloomy concert dance in Le Orme and their theatrical singing to Banco Del Mutuo Soccorso. Jubilant synths, classical piano passages and sublime mellotron sounds determine the sound, which arouses more relaxed than stirring feelings. The guitar is mostly used for background music. Bass and drums, especially in the contrapuntally arranged pieces ("Chiusa 1915"), provide a solid rocking basis that could compete with that of PFM. Guest musicians on flute, violin and cello provide additional timbres. In contrast to the Italoprog classics mentioned above, the band still lacks a few corners and edges - with which it was possible to bridge even the most extreme lengths.